This U.K. woman appeared on Britian’s own “The Jeremy Kyle Show” in 2015 to make a plea to her boyfriend’s ex to stop harassing her. What she got instead was a barrage of cruel comments from viewers about her teeth—though, in the aftermath of the show, she went on to have a radical transformation indeed. When Gemma Swift was just 6 years old, she was fooling around, walking backwards, and suddenly turned around and smashed into a post. Although she recovered from the accident over time, her teeth didn’t. The force of the impact caused her teeth to develop improperly, leaving her with a rather startling appearance later on. It didn’t stop her from living her life into adulthood or from meeting a man named Tony. 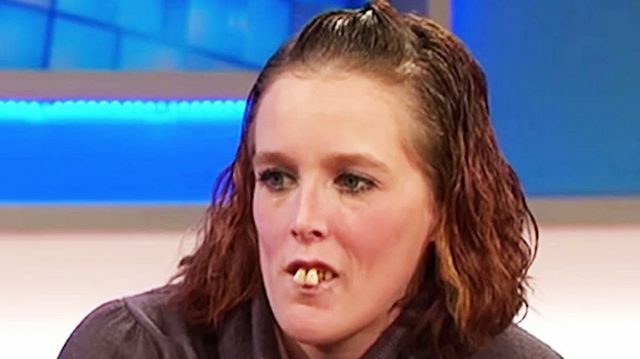 When Tony’s ex continually harassed her for her looks, though, she decided to take the drama onto “The Jeremy Kyle Show”—where her teeth, unfortunately, made quite the impression on his outspoken viewers. In the weeks following the show, she was called any number of names, including “tooth lady,” and was compared to horrific cinematic monsters and freaks. Although she was no stranger to her own appearance, she hadn’t expected the audience to be quite so cruel. Kyle and his production team, though, wanted to make sure she never dealt with that kind of reaction again—so the show offered up $10,000 worth of dental work to fix her problem, giving her a whole new set of teeth and a second appearance on the show afterward. A year later, she came back on stage with Kyle and her dentist—and this time, she looked quite different. Where previously her front teeth were severely protruding forwards, she now had a row of straight, even dentures, giving her the first smile she could feel confident about in years. Though not every reaction to her new teeth was fully positive, the majority of the responses she got on the internet were overwhelmingly good. People reached out to congratulate her and show her support, reinforcing her belief that things were only going to go up from there. Now, she told Kyle, she can “hold her head high” when she walked down the street during the day. The experience, no matter how harrowing in the middle, had changed her life.